As we haven’t featured concession stands in any previous posting, a salute is long overdue. Here are a few that stand out. Decoration and promotion were always prominent in the bigger houses. Planter’s Peanuts has evidently taken over one of these counters, while ice-cream sales are emphasized on another. 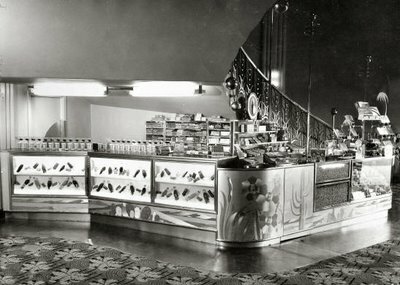 That lavish stand underneath the stairway looks inviting --- what a selection these vendors must have had --- and in those days, of course, a round of snacks didn’t have to cost ten or fifteen dollars as they would today. I remember going to see Miracle Of The White Stallions in 1963 with only three cents left as I entered the lobby from the boxoffice. Old Frank at the confection window looked askance when I asked for a pack of Kits with water, but what more could a few pennies buy, even then? I always avoided popcorn, having read of a boy who’d choked to death on an errant kernel while watching a double feature in some unnamed locale. My idea of Heaven was a ten-cent Baby Ruth --- those jumbo treats put today’s Lilliputian bars to shame. They even sold hamburgers at the Liberty. I used to have one of those on Saturdays, only I didn’t care for the rancid slaw they used as a garnishment, so I just scraped it off onto the floor. Another boy slid on it the day we went to see The Reptile and took quite a spill over the seats in front of us. My viewing of Cat Ballou was spoiled by a mouthful of Pom Poms that neatly separated a very large filling from one of my back teeth. I’ve avoided that movie ever since. Some high school friends and I brazenly entered the Liberty’s auditorium during the 1972 re-issue of The Ten Commandments with a box of Krispy Kreme doughnuts, on the theory that one might need fortification in the face of a four-hour show. That thirty-two-ounce bottle of Coca-Cola we brought to wash them down only compounded our error. Management invited us to enjoy our picnic on the street, as glassware and baked goods were not welcome on the premises. Maybe these pictures will evoke concession memories for some of you. If so, by all means feel free to permeate the Greenbriar lobby with your own popcorn-scented recollections. 1964: I clearly remember, while seeing "The First Men in the Moon" at the Opera House, the glistening faux-butter from my popcorn glistening on my fingers like silky hogfat. I could almost see the reflection of the screen on my fingertips.